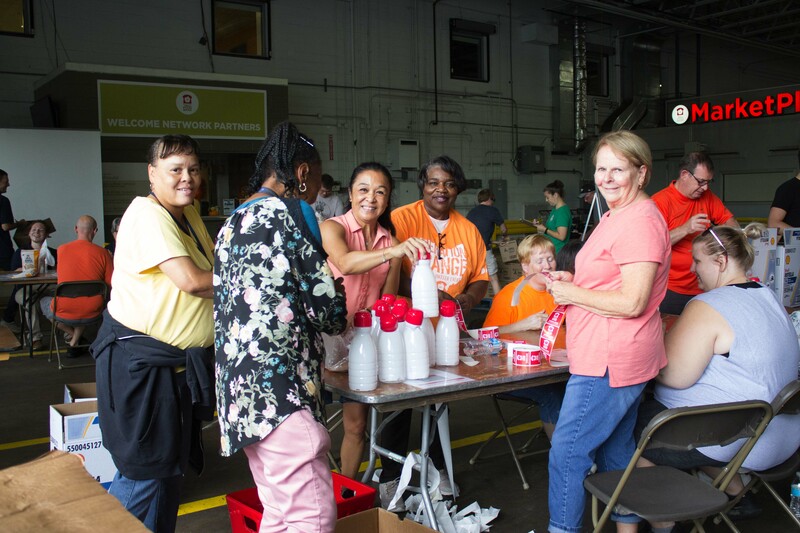 The Akron-Canton Regional Foodbank hosted nearly 2,000 community members during Operation Orange on Sept. 7 through Sept. 8. The sixth annual 24-hour volunteer event celebrates Hunger Action Month, a nationwide effort to raise awareness about food insecurity and mobilize the public to take action against hunger. The community truly glowed orange, the color of hunger relief, during this event. Throughout the day and night, volunteers committed to 2-hour shifts to keep warehouse projects running for a consecutive 24 hours. Volunteers worked on projects including sorting and bagging nearly 93,000 pounds of fresh apples, potatoes, onions and clementines, labeling cans, cereal and bottled water, and sorting and repacking 15,120 pounds of frozen meat. With their help, your Foodbank will be able to distribute the equivalent of nearly 143,000 meals to our network of partners within the coming weeks. This year the Foodbank worked diligently in recruiting Night Owl volunteers for the shifts between 1am-5am, which have been the most difficult to fill. With exclusive blackout t-shirts, goodie bags, and fuel to keep them moving from Monster Energy, Night Owl shifts were completely full this year! This year for Operation Orange, the Foodbank was excited to work directly with Ohio farmers to source fresh produce. The Foodbank continues to focus on offering nutritious, fresh produce to its nearly 500 hunger-relief programs, including food pantries, hot meal sites, shelters, backpack programs and other hunger-relief initiatives. To keep the energy levels high all night long, Celebration in Sound DJ service entertained volunteers, along with an array of events including a selfie station, trivia games and an hour of fun-filled dancing with local mascots, including Zippy from The University of Akron, Cuppy from Dunkin’ Donuts and Pigskin from the Stark County Convention and Visitors’ Bureau. Operation Orange was made possible through generous donations by title sponsor Dominion Energy, as well as Faith Family Church. To learn more about the Foodbank and other ways you can get involved for Hunger Action Month, please visit akroncantonfoodbank.org or hungeractionmonth.org.